Fan Art Up! is a weekly meme hosted by Tabitha @ Not Yet Read. It is dedicated to showcasing our Fan Art inspired by entertainment media, whether it’s Books, Movies, Anime, Comics, etc. Spread those peacock feathers for us! 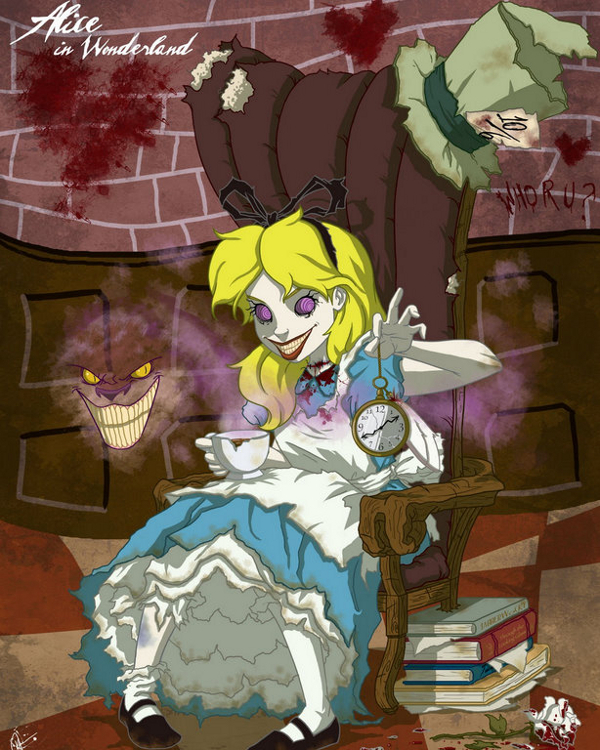 I have a thing for Alice in Wonderland….but then who doesn’t? Well I tell you what – my WEDDING was even Wonderland themed. We made hats, mushrooms, stuffed cats, had a door mouse, and an over 6 foot tall papier mache caterpillar that blew smoke (yes believe it!) Among many other things – it was a fabulous day. So when I saw this book I had to have it (I have a small collection of Alice books) plus I love illustrations and these ones are FANTABULOUS! I’ve also included some wedding pictures for you to peruse. Wicked, wicked photos. Wish I had a top-hat in one of my weeding photos. Though I do have a cool one of me leaning on a turtle while my wife looks on disapprovingly (staged, of course). Hah a turtle huh? How big of a turtle? Just a turtle statue of medium size. I have a small love of turtles that can’t be explained. Fabulous, fabulous wedding photos. Just wonderful! Hubby and I are huge Alice fans but we didn’t quite get to the themed wedding. We hold cosy little Alice dinners, though, with lobster (of course)jam tarts and checkerboard cake. Do I have to submit something recent? Your Alice dinners sound lovely. Do you mean submit a link on the fan art link up? I’m fine if you have an older post you wanted to link up. But typically yes it would be something from this week thru next Wednesday. I look forward to seeing the art you’ve done. Even though you know I stalked your pics on facebook, this is the first time I noticed your little, lacy gloves, and I LOVE them! And I love that little guy on the table too (with the cards). Did you make him? Great post, dollface. MUAH. I LOVE those lacy gloves! You know…I don’t even know where they are anymore *cries* We didn’t make the playing cards but we did hand write the name cards for each person and attached them to an ‘antique’ key with a “key to your seat” board. My sister made all the mushrooms with help from me, she made the cat, she also made a mouse. Hubs cousin made the two top hats, his wife made the wedding ring pillows…hubs and his cousin made the caterpillar. A artist made out cake toppers – ooo you saw them they are adorable…and hmm what else was made….the billboard…I’m sure there’s more. My husband’s cousin made both of those hats! OMG. I love it! Your wedding photos are fantastical! And that book cover is gorgeous. Gorgeous photos, and I love your dress. I am very picky about wedding dresses but that one is perfect for you and the Alice in Wonderland theme. It really was perfect – I can’t even tell you how many different wedding dress boutiques I went to before I found this one. The back when bustled made it look like some exotic bird. It was gorgeous. I can’t believe you only get to wear them once! haha Thanks Amanda! I have to agree with you about my husband – he’s a pretty hunky catch in that tuxedo of his. Big dopey wonderful nerd that he is. I will definitely try to share more personal things. You are right – this is my blog and I should totally put more of “me” into it lol. I love the art you showcase each week. And this is just great. What wonderful wedding photos! I don’t think my husband would have worn a top hat though. We do have pics in a park with snow since the wedding was in January…LOL. a snow wedding! How magical! I’ve seen photos of a wedding that took place in the snow. I’ll bet it was lovely. Heck I was surprised I could get him to calm down he wanted a full out costume wedding from all the participants as well! What an amazing photographs, you two look gorgeous 😀 And what a fun idea! I really want a themed wedding as well, but I’m not sure I get my boyfriend crazy enough to go that far. He is more into traditional style. [email protected] recently posted…Review 265. Lisa Ann O’Kane – Essence. Thanks Lisa – me too! I only wish wedding dresses weren’t one time wear only’s. Where can we wear those dresses to again!? So freaking awesome. That hat, the table decorations — your photographs are stunning. Especially the old-timey one. I definitely married the right man for me. We both are so zaney and love doing things like this. I’ve already told you this, but your Alice wedding is KILLER. I loved seeing these photos all over again, so I’m happy to see them live here on the blog! They look so good! Did you see this one? I absolutely love how dark and creepy that one is! Have I mentioned how much I LOVE Alice in Wonderland? And, I’m kinda jealous that it was your wedding theme! Thanks for sharing some pics; they are stunning! I don’t know anyone who doesn’t love Wonderland! Wouldn’t it be fun if all weddings were themed? The husband and I definitely plan to do a full on costume themed renewal like 20 plus years from now. I adore the little drawing I did. I’m REALLY REALLY bad at limbs so my husband has to give me help sometimes. I go begging to him “help me fix my legs” lol. The wedding was a blast. And oh yeah – I’m going to buy some copic markers today so I can finally start trying to add color! OMG those pictures are so fantastic. And, I love the Caterpillar! Somebody actually told me a few days ago that I reminded them of the Dormouse from Alice because I’m always wanting to nod off! I’m okay with that – although they’re quite mistaken. I’m actually a long lost relative of Rip Van Winkle is all. That sepia photo is really good and it makes your dress look feathery! Thanks Lynne! The caterpillar was such a big pain to build but I know it was so much fun. We donated it afterwards to a children’s elementary school and they used it in a Alice in Wonderland play they put on. Neat huh? The dress really DID look feathery. When it was bustled in the back I looked like some sort of exotic bird.